A time has come where ignorance is just an option. You can know the truth or willingly hide from it. Colonizers are now using the same techniques they used before to steal land but instead of shooting they are printing up money and "purchasing" land with hostility and calling it gentrification. Gentrified areas are breeding grounds for racism and pink terrorism. It is by these tactics, and these tactics alone, that pink people have been able to survive. Black death and disenfranchisement = pink survival. The colonizers are ramping up their demonic tactics knowing that this information is out there. Knowing it only takes one person to wake up to stop their madness. Knowing that their reign of terror can end tomorrow or this very second if the people wanted it too. What is the MABA movement? How is it changing everything we think we know? 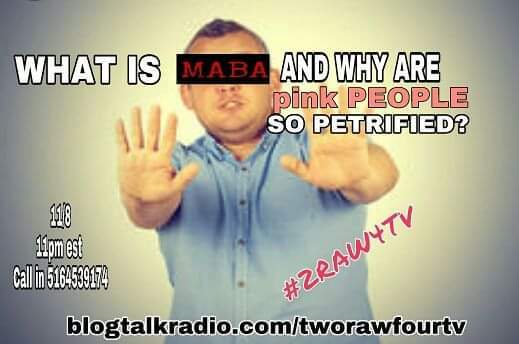 ...and why are pink people so scared? WHAT IS MABA AND WHY ARE pink PEOPLE SO PETRIFIED? Find out #2NITE exclusively on #2RAW4TV!